While adults regularly discuss probiotics as part of their overall health regimen, I rarely hear parents talking about probiotics as part of their baby’s nutrition. In fact, a recent survey Stonyfield found that 77% of parents of children under age two do not incorporate probiotics into their baby’s daily diet and over a third (36%) don’t think it’s important at this age*. I’m here to start the conversation, because probiotics do play an important role in baby’s health and you want to ensure they’re receiving them. Here are some important points on probiotics to consider. I recommend discussing it further with your pediatrician at your child’s next appointment. Probiotics are good bacteria that help regulate your baby’s gut health. Emerging research shows that gut health not only impacts your baby’s digestion, but can also help with regulating stools, support immunity and keep your baby healthy. Babies are first exposed to probiotics in breast milk, which is naturally rich in pre and probiotics. As you transition off breast milk, babies lose those probiotics unless they’re supplied by another food source. Although many adults turn to supplements to up their probiotic intake, that’s not necessary for a baby. 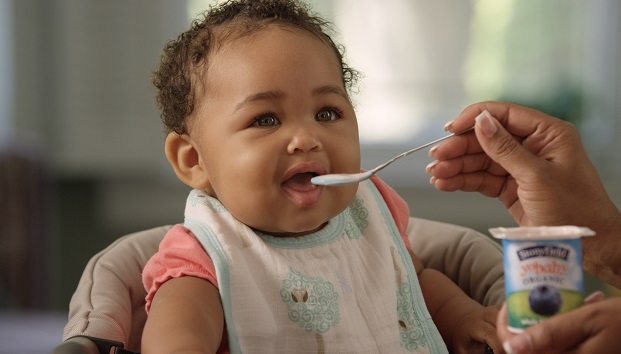 For the amount they should be receiving, you can easily supply it through a probiotic rich food, like Stonyfield YoBaby® organic yogurt, now with added BB-12®. Yogurt is on my list of “11 Foundation Foods.” It’s an excellent food for babies starting at 6 months of age as it provides protein, calcium, vitamin D and of course, probiotics. Formulated specifically for babies, Stonyfield YoBaby® is the #1 Pediatrician Recommended yogurt for babies 6 months to 2 years among refrigerated yogurts** and is what I feed my boys and recommend to my patients. Stonyfield recently added the probiotic, BB-12® to YoBaby. BB-12® has been shown to have a digestive health benefit when consumed regularly as part of a balanced diet and healthy lifestyle by promoting beneficial gut bacteria and regular, soft stools. *Survey Methodology: ORC International conducted this research on behalf of Stonyfield via an online survey of among 1,016 parents of a child two years of age or younger, fielded August 23-29, 2016. Additional follow up questions were asked to 1,004 parents of a child two years of age or younger January 4-10, 2017.